DIY for the Weekend: Light Up Your Halloween Costume! Want a costume that lights up? 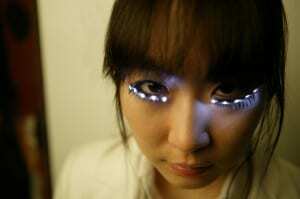 LED eyelashes? Or maybe a mask that will control your music wirelessly? We have the resources to help you turn your bright idea into the perfect costume. You are a Super Hero and need to contact your Super Hero partner. Make: Wearable Electronics will help you learn the skills necessary to create your own super hero communicator cuffs. Each pair of cuffs has an electronic switch and when the wrists are crossed, a wireless signal is sent to your partner’s cuffs. The transmitted signal causes the cuffs to light up, letting your partner know you need them. Or maybe you want to let them know you found the best Halloween candy at the party…. “Dream Squawk” mask created by Amy Khoshbi. Make: Wearable Electronics will help you learn Lilypad Arduino and Xbee – which are used to make the cuffs – and so much more. 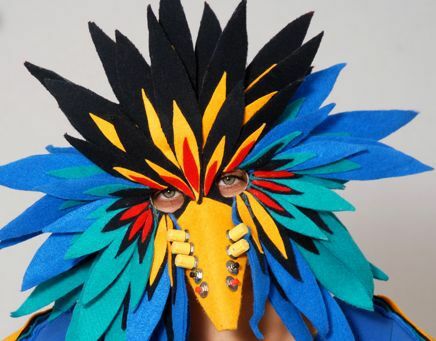 Maybe you want to make a “Dream Squawk” mask which allows you to control music and sound wirelessly. That could really amp up your party…..
How about Quorra from Tron: Legacy? This costume also uses LilyPad and Cool Neon‘s LED ribbon. LilyPad was designed specifically for e-textiles and clothing and Make: Wearable Electronics provides experiments so you are able to try those new LilyPad skills. Starboards are flexible circuits that can be sewn directly into garments. Creator Meredith Scheff also offers low resistance (2.5 ohms per yard) solderable conductive thread. It is a conductive thread that is also solderable and it strong enough to be used like regular sewing thread. Wear Space Face Galaxy Light Up Makeup, inspired by the constellation Cassiopeia, and you could be the star of the evening. 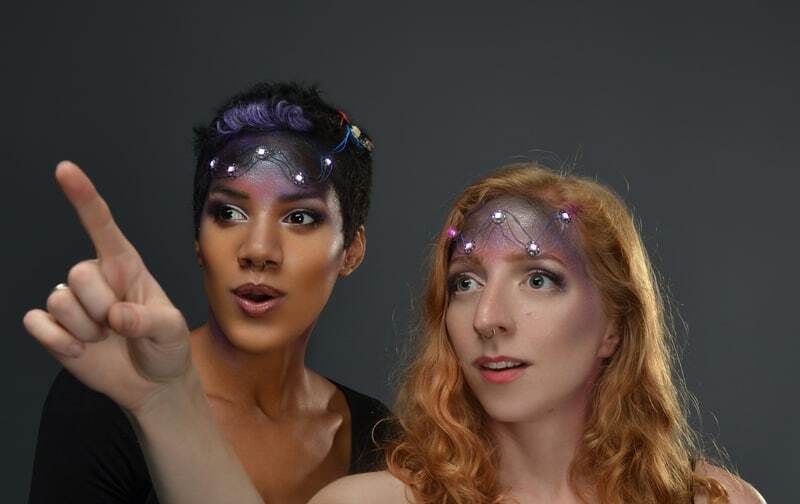 This spacey headpiece uses 5 FLORA NeoPixels. Make:Wearable Electronics has an example to help you get started using this versatile module. It is wearable, sewable, easily wired, individually addressable, ultra-bright, multicolored LEDs – what’s not to love? How about LED eyelashes to go with your butterfly dress? Again, LillyPad is used to build those LED eyelashes that will brighten your eyes! Make: Wearable Electronics also also explains how to work with Aniomagic – an e-textile toolkit that is similar to LilyPad and FLORA. Use Aniomagic to create a light-up bracelet, belts and almost anything else you can dream up to go with those bright eyes and butterfly wings! Want to have the brightest brain in the room? Create your own “Thinking Cap.” It is biometric-data-driven, and responds to fluctuations in EEG signals. Whatever bright idea you have about a wearable tech costume – we’ve got the resources – information on everything from circuits and batteries to conductive materials and how to make your ideas wearable! Hartman, Kate. 2014. Make: wearable electronics. Sebastopol, CA : Maker Media. Engineering Library QA76.592 .H37 2014. DIY: Superhero Communicator Cuffs. 2012. OCAD University. Light Up Your Life With LEDs, Sewable Circuitry. May 29, 2011. Wired. Cool Neon Lighting. 2011. Cool Neon EL Wire. How-To: Space Face LED Galaxy Makeup. Oct. 10, 2013. Maker Media. LED Galaxy Makeup – SPACE FACE. youtube. Oct. 9, 2013. Mom’s Homemade ‘Star Wars’ Costumes Will Blow You Away. Oct. 27, 2015. Yahoo! News. abc Good Morning America. Explore Our Library! Social Media!